You're not in Kansas anymore! 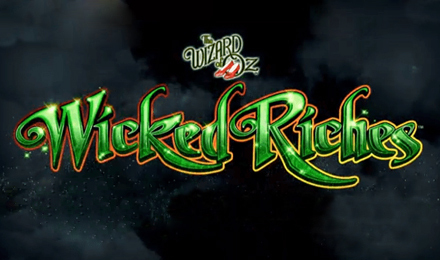 Wicked Riches Slots follows the Wizard of Oz's Wicked Witch of the West. There are flying monkeys, loads of FREE spins and more so follow the Yellow Brick Road at Moon Games! Follow the Yellow Brick Road! This Wizard of Oz themed video slot game takes on a bit of a dark twist, focusing on the Wicked Witch of the West. There are 5 reels, with symbols such as a haunted castle and broomstick, and 30 paylines. Look out for the flying monkeys that will fly around the reels and turn any symbol into a Wild. There's also a Wicked Riches round where you can get FREE spins or extra Scatters. You can also re-trigger those free spins and multiply your wins!